The best high density MicroSD cards are now up to 400GB, with prices under $100. We review two offerings from SanDisk to give you great value, reliability and the maximum storage. These are great for memory expansion in your Android smartphones and tablets, and digital cameras. Related – Looking for standard SD Memory Cards? Check out “Best SD Memory Cards” review. For about $80 on Amazon, you can get the “Ultra” 400GB UHS-I, “A1” card with a SD adapter to easily access the card in your computer. 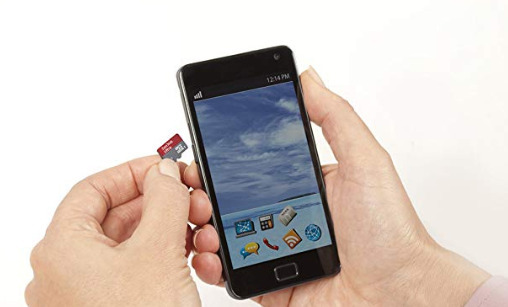 We like that this MicroSD Memory card is speed rated “UHS-1” / “Class 10”, which means you get Full HD (1920×1080) video recording and playback. Data transfer speeds are up to 100MB/s for Read and 90MB/s for Write. These are for bursting, and not for continuous reading or writing (e.g., video recording). Make sure you are using this in a USB3.0 / 3.1 compliant port, otherwise your speeds will be dramatically lower. As an example, you could move over a 1K typically sized photos (e.g, 3.5MB/photo) in under a minute. See below for full details on on the speed parameters and what the different markings on the cards mean. We also like that SanDisk has a “Memory Zone App” for easy file management it helps to organize data on Android-based devices and effortlessly back it up to the card. They also have “RescuePRO” back-up / recovery software which simplifies recovery of files that were accidentally deleted. (Download and Installation Required). Adding 50% to the cost, at about $125, is the extremely fast “Extreme” 400GB “V30” / “U3” / “A2” microSD card with adapter. Faster than the “Ultra”, you’ll get Read up to 160MB/s (versus Ultra’s 100MB/s) and similar 90MB/s for Write. We really like how fast the “Extreme” cards are – they keep up with everything we can do on our devices. This means you can very quickly transfer high-resolution images and 4K UHD videos. More importantly, you can capture uninterrupted 4K UHD and Full HD video without skipping frames or having the video freeze. These cards can take a lot of abuse. They are built for, and tested by SanDisk, to operate in harsh conditions. They are temperature-proof, water-proof, shock-proof and x-ray proof. You get the same “Memory Zone App” and “RescuePRO” as with the “Ultra” series of memory cards. “UHS-I” (Ultra High Speed, Phase I) – a standard which describes bus design of the internal memory chip interface for two options, for up to 50MB/s (UHS-50) and 104MB/s (UHS-104) data transfer rates. Basically, it means that these memory cards are fast enough to record photos shot in RAW (uncompressed) formats, even if you are using burst mode. “U3” (UHS-3, Ultra High Speed, Phase III ) – means a guarantee of 30 MB/s sustained sequential write speed. “V30” – is the same 30 MB/s continuous recording speed as “U3”, but as a standard for video format devices. “U3” or “V3” mean if you are doing video on your phone, camera or recorder, these cards can handle all formats including Full HD 1080p (1920×1080), 4K Ultra HD (3840 x 2160) and 3D. And this just gets you to the low end of 8K video recording, for anyone thinking that far ahead. “Speed Class 10” – rating means a guarantees the card has a minimum sustained sequential write speed of least 10 MB/s. “A2” – For running applications directly from the memory card, it must have a random performance of at least 4000 read IOPS (Instruction Operations Per Second) and 2000 write IOPS. In addition to enhanced random performance (vs. 1500/500 read/write IOPS mandated by the A1), A2 cards are required to support such functions as command queuing (with a minimum depth queue of 2 and a maximum depth queue of 32) to optimize random read performance, caching to hit write performance targets, as well as self-maintenance capabilities. The SD Association’s A2 spec was designed specifically to improve performance of applications that are installed on microSD cards. Note that the latest versions of Android only allow users to install apps on A1/A2-badged microSDs, so this could be a deal-breaker when looking for memory cards. One thing to keep in mind is that the amount of actual storage on all types of memory (USB Flash Drives, SD Cards, Hard Disk Drives, etc.) is always somewhat less than the advertised space. This is due to various software and “overhead” necessary for the operation of the device. If you want the highest capacity microSD cards, get the value priced SanDisk Ultra 400GB microSDXC or the extremely fast SanDisk 400GB Extreme microSD from Amazon.